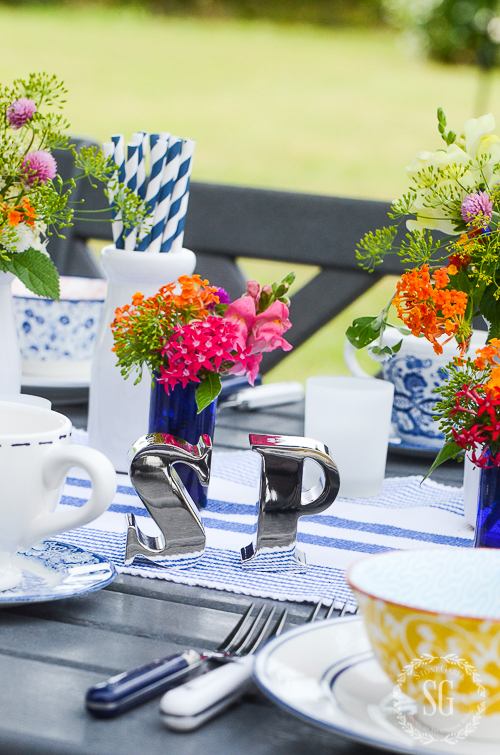 Setting a table is one of my favorite things to do… and better yet if it is al fresco! Over the years I’ve been collecting dinnerware and linens and accessories in just a few colors so I can turn all these items into endless and interesting tablescapes. My favorite colors to collect are blue and white. 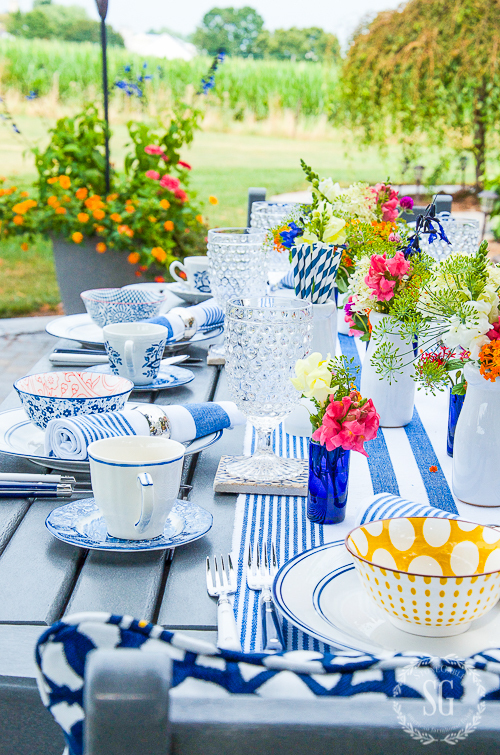 So, today I’m entertaining on the patio and sharing tablescaping tips and tips for collecting all things blue and white. Come on, let’s dine al fresco today! If you are coming from Cedar Hill Farmhouse, thanks for stopping by! I bet you are still dreaming of Anita’s gorgeous French inspired al fresco dining on her farmhouse back porch! 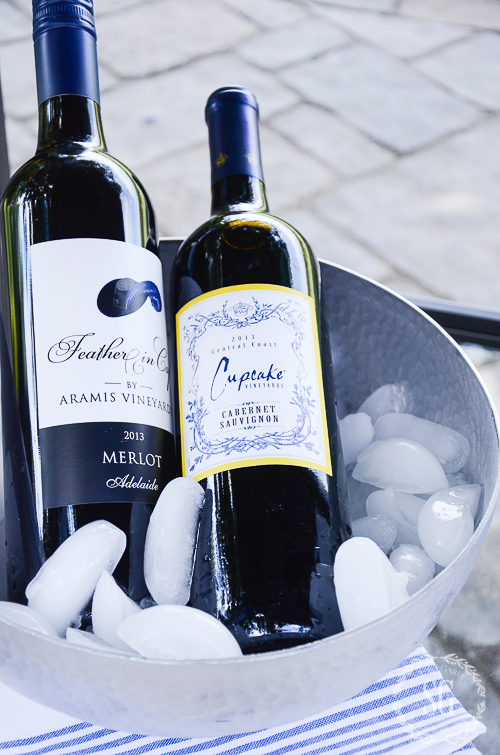 Grab a drink of choice and settle in! I have lots of pictures and idea for you today! 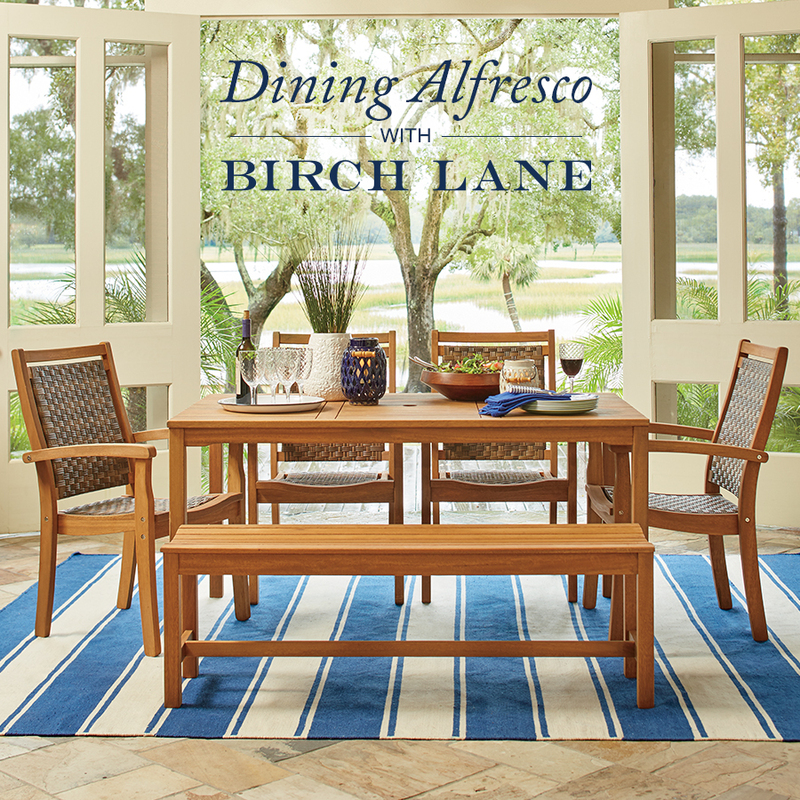 A big thanks to Birch Lane for sponsoring this post. 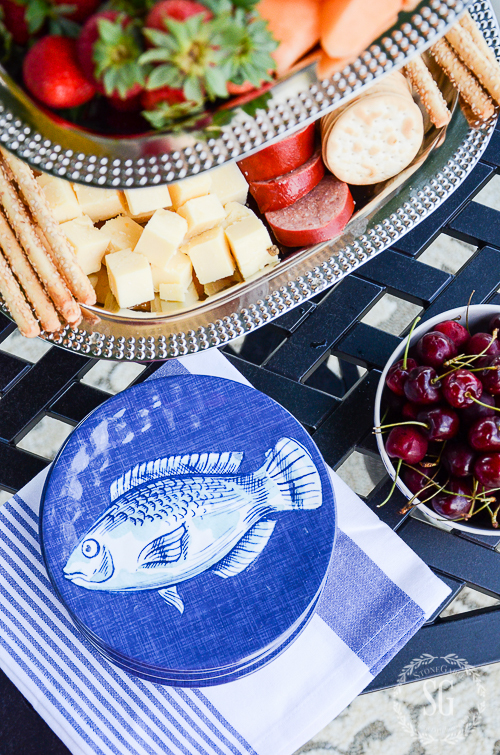 Today’s al fresco table is easy to set and casual. 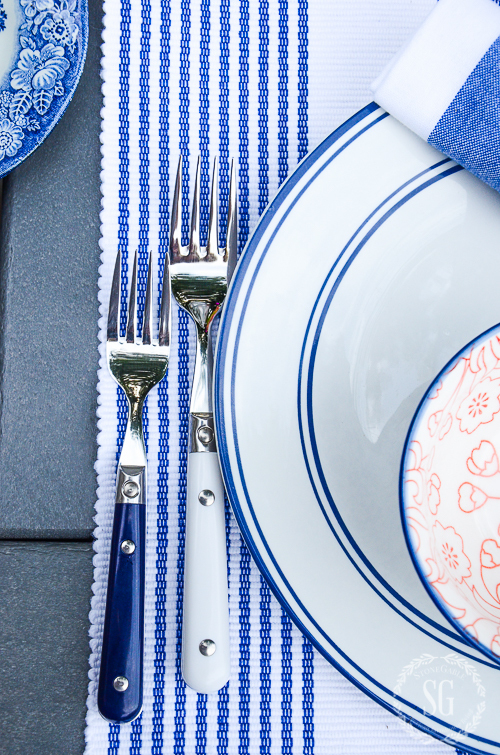 No placemats at the table, just a blue and white striped table runner that lends itself to farm-to-table dining! No fussy linens on this table. I want ones that I can pop right into the washer! And who needs fuss when you can have blue and white stripes! Many blues work together. So don’t shy away from mixing different hues! Each place is set with a simple white plate with blue banding. Simple but oh, so pretty! This is my new go-to plate! One of my very favorite colors to mix together for fall is blue and orange! They are complimentary colors and look FABULOUS together! Give it a try! 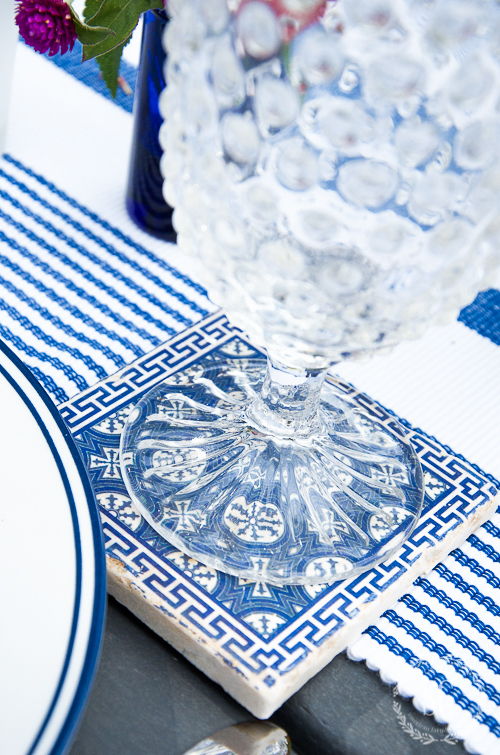 A cotton blue and white striped napkin is rolled up and held together by a pretty silver hammered napkin ring. For this tablescape, I’m mixing a few pretty silver pieces with more casual ones. 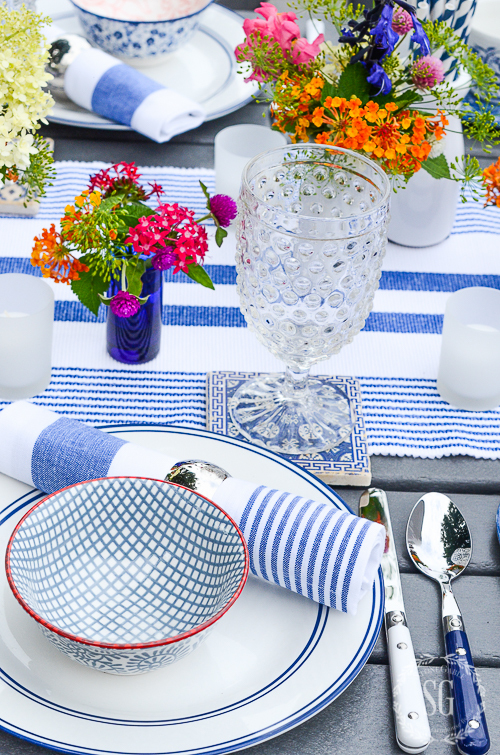 The stripes on the napkins give a nod to the table runner. Blue and white work any time of the year. It all depends on what you work in with it. 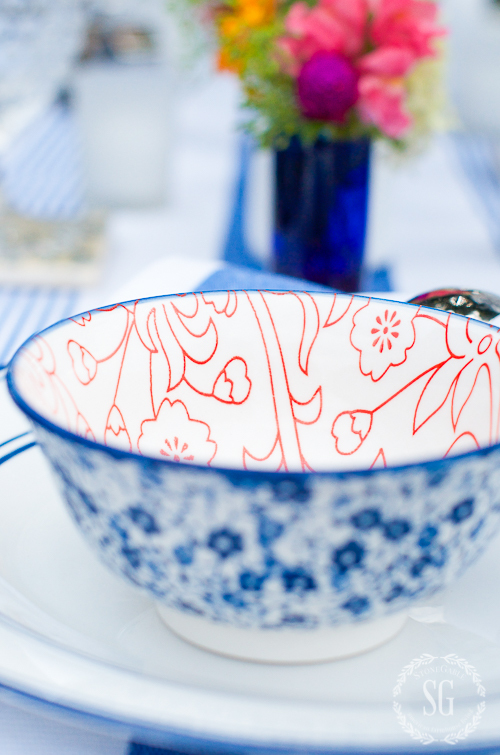 I was originally going to use only blue and white on this table until I saw these darling bowls! Go with your creative whims when setting a table. It should be an expression of you! These little bowls are so different… so happy… so unexpected. I just had to use them. Sometimes, when you find something you just love love love you might want to pick it up even if you don’t know what you want to do with it. These bowls are a great example! I knew that they would become a favorite of mine! Look at all the sweet patterns on the inside and outside of these bowls! Colorful handled flatware are perfect for summer! Collect them in lots of colors to mix and match! I mixed white and dark blue. How fun is that? Don’t you love these so adorable hobnail water goblets? They are heavy and sturdy and so so girly!!!! They have an old-fashioned, throwback charm. What a find! The best tablescaping tip I can give anyone is… USE WHAT YOU LOVE! Don’t save things for special occasions. Make every day special! To add another layer of blue and white I put the glasses on coasters. Just like in decorating, layer… layer… layer! 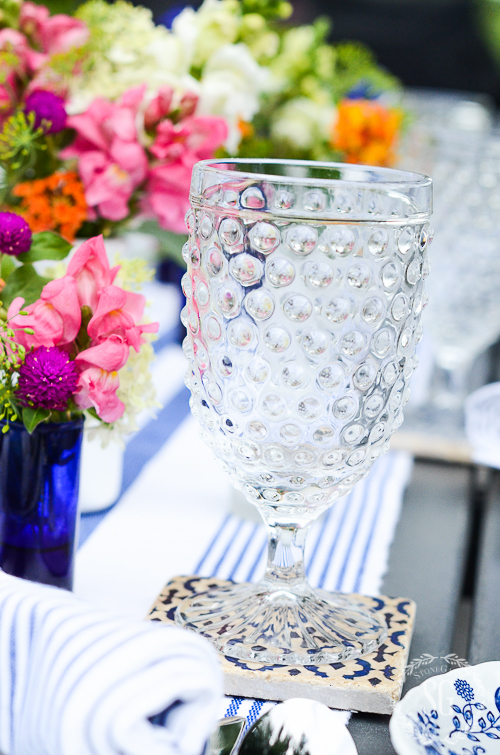 It’s the little details that make a nice tablescape a fabulous one! Salt and pepper shakers… a little more silver on the table! The silver reflects the colors in the tablescape. I collect blue and white cups and saucers. And then I mix them up…no matchy-matchy here! It’s little things like this that make a table so fun to set and hopefully as fun to sit at! 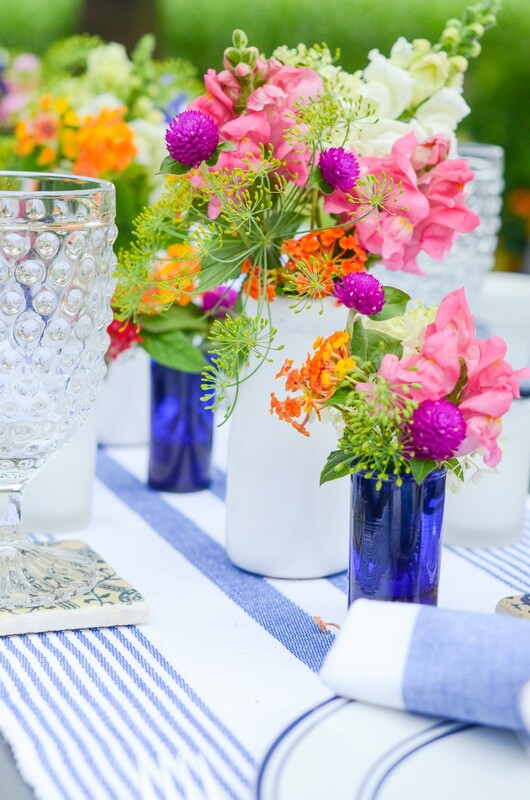 Small white milk bottles and vibrant cobalt blue shot glasses run down the table filled with just-picked garden flowers. If you have herbs make sure to tuck some into your arrangments. They smell delicious! I used mint and dillweed flowers today. I prefer to use nontraditional containers for flowers! Milk bottles, shot glasses, Mason jars, small galvanized buckets. Think outside the box and repurpose household items to hold flowers or pumpkins or greens or Christmas balls or whatever you use as a centerpiece. Why don’t you sit down and have some nibbles and a drink before dinner? 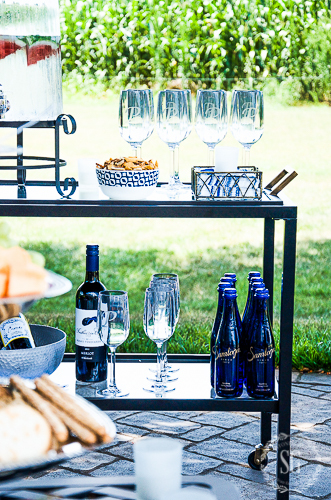 It’s a nice idea to set up a bar cart on the patio. This one has wheels and the top comes off to make a tray so it’s light to wheel inside and outside. 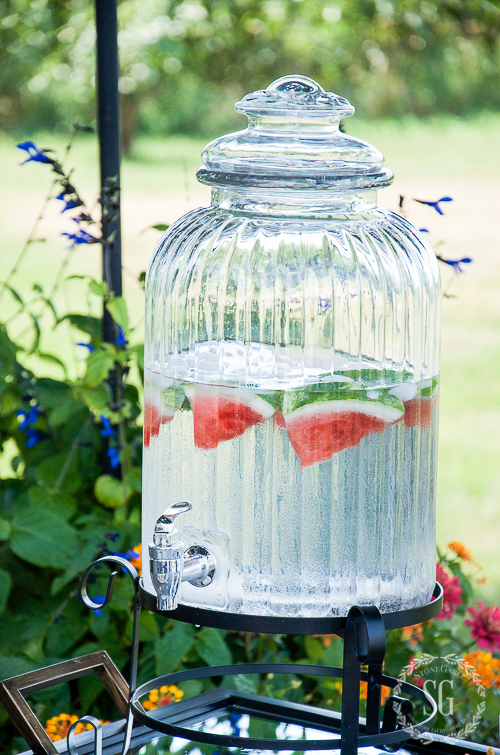 The drink dispenser holds water infused with watermelon. YUM! It is beautifully made and has a mirror tray top. This bar cart was a steal for the quality! I used this hammered silver salad bowl to chill wine. It’s just the right size! Appetizers are from the deli and produce sections of my grocer’s. If you are cooking a meal, buy the appetizers!!!! Instead of spreading appetizers over a table, go vertical!!! So easy and it takes up so much less space! I think we have a theme going here… easy! And easy can be pretty too! Hope you enjoyed the al fesco dinner on the patio! How about you? What color dishes do you collect? And if you have a tablescape tips share it with us! You might like to follow me on Pinterest and see the great things I’m finding to pin every day HERE. I hope you stop by CRAFTBERRY BUSH tomorrow. 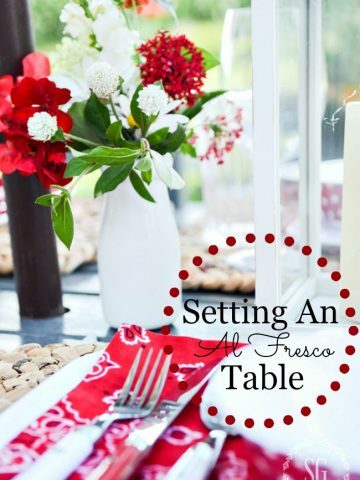 Lucy is sharing her fabulous al fresco tablescape! Oh Yvonne your table is so beautiful. I love blue and white for the summer . 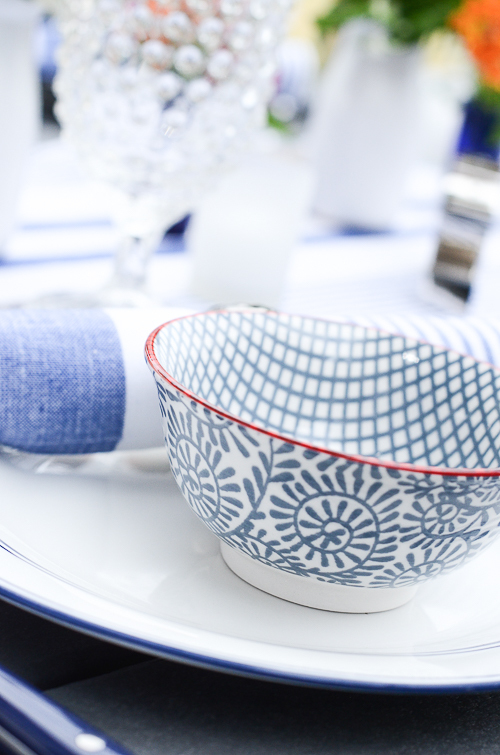 Ever since I started following your blog since I love so much everything you do and put together, I also started to collect white dishes and of course I have some blue and white. Of course not as many as you but I’m hopping my collection will grow in time . As for if any one has any tips or ideas well I think you’ve covered it all perfectly .Have a wonderful day and my wishes for a fast recovery from the second surgery. What talent! Great ideas and so beautiful!You are an inspiration! After retiring from the Service Industry and offering “Al Fresco” dining options to the delight of customers, I am now thrilled to enjoy my own al fresco dining for family and friends. Your beautiful layering options are wonderful suggestions and I’m looking forward to trying them for my next outdoor event. 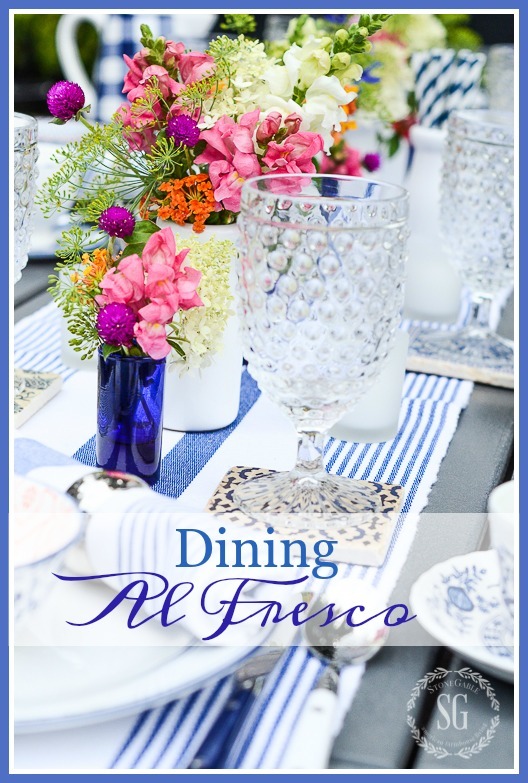 Loved the al fresco tablescape! Blue and white is always so fresh and welcoming. 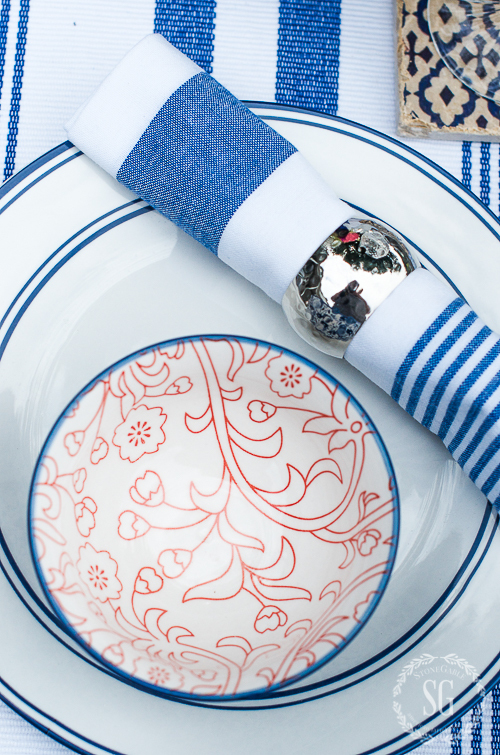 Check out Bon Ton in Park City – Royal Doulton has a great line of blue and white dishes called Pacific. They would be a great addition to your blue and white collection. Diner en Blanc season is now upon us – the white pop up picnic – and I have a tiered silver server like the one in your photo. I like the way you put fruit and antipasto on yours, so I’m inspired to do the same for DEB! Thanks for the inspiration! I don’t know where to begin!! I want to have a party outside! Love the Hotmail glasses….dreamy. The blue is so refreshing. How lucky your guests are to enjoy such loveliness while dining. Simply gorgeous, Yvonne! Where do you keep/store all your beautiful dishes? Hi Yvonne… I have told you before that we would be great friends if we lived closer..your porch setting is so inviting. 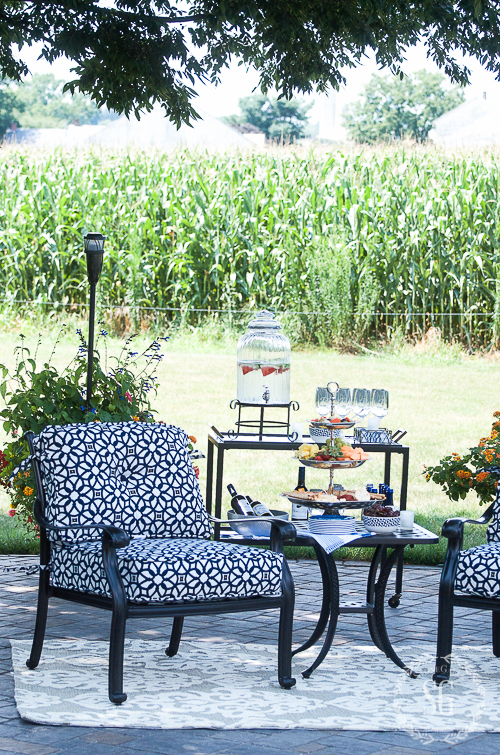 I would love to sit there with you and visit over a glass of ice tea…your yard is so peaceful looking out over the fields..God has blessed you, and you continue to bless so many others..thank you. Stunningly beautiful! 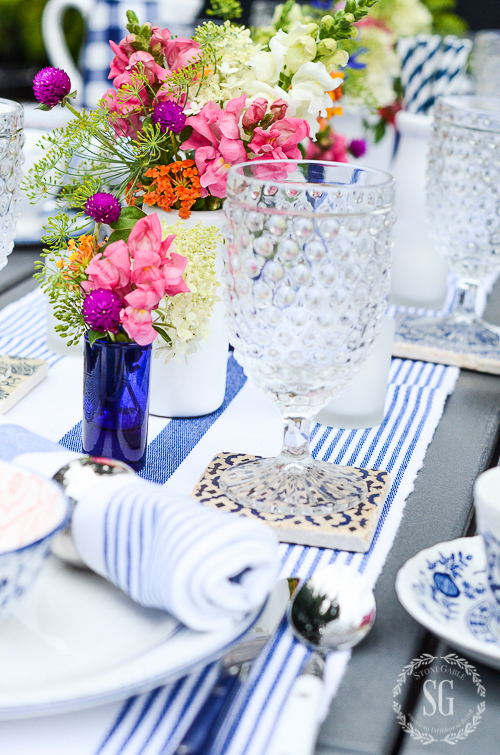 Blue is my favorite and the blue & white combo for any decorating project or tablescape is always a winner! 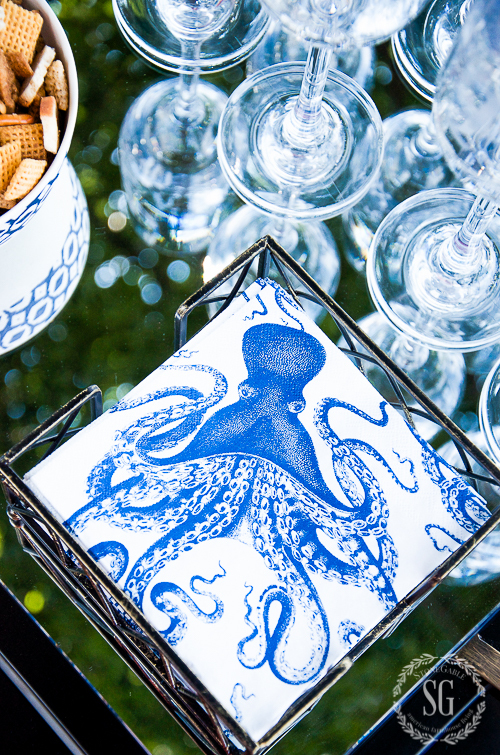 Love the octopus napkins, too! Oh wow – you are inspiring me with so many wonderful ideas to use in our new home. You have no idea the impact you are having on our interior design. I love the blue and white with touches of yellow. You are helping to make my dream come true. Thank you! I really like the different color bowls! 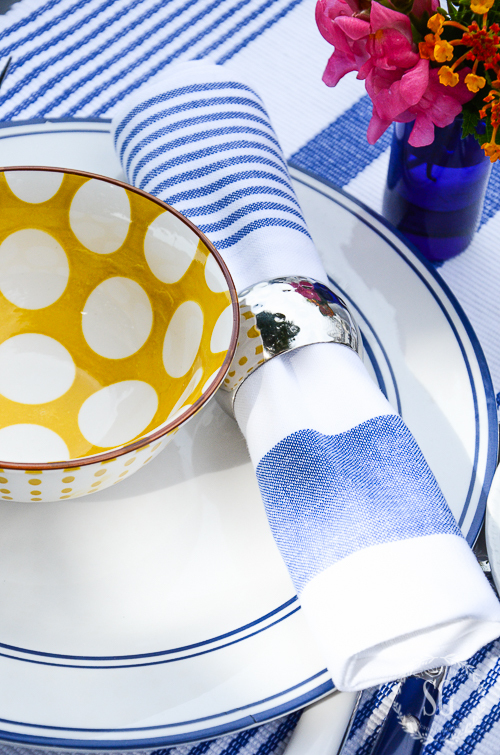 Blue and white is my favorite but the yellow adding a nice touch to the tablescape. 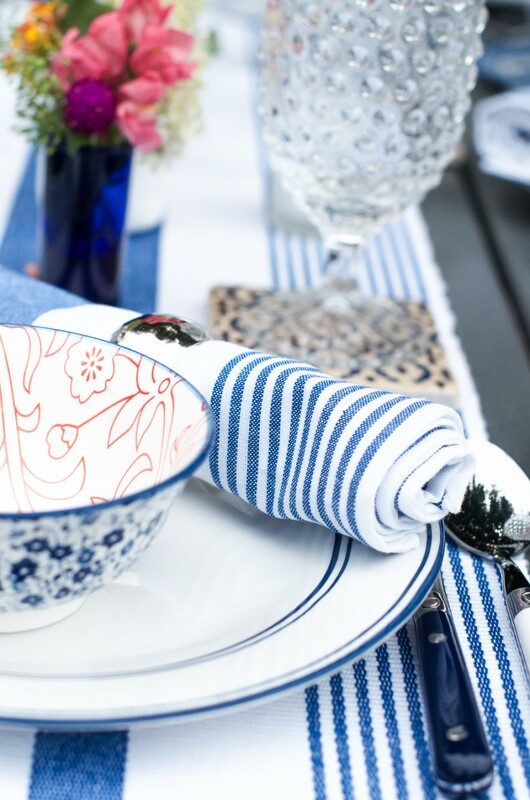 I love blue and white and I love this tablescape!! 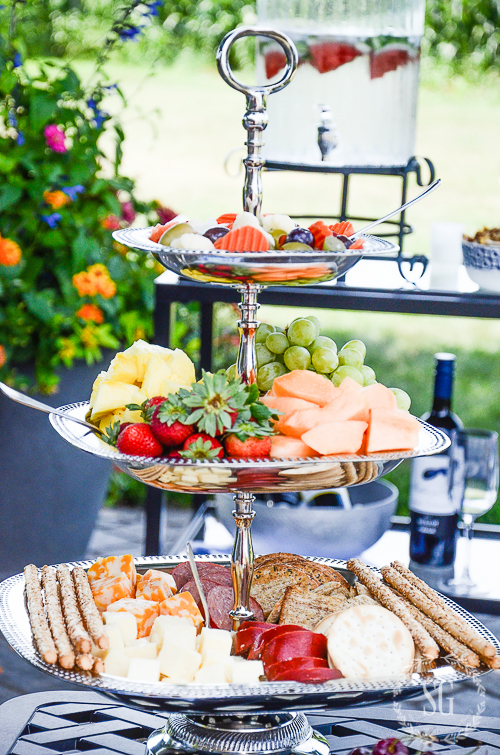 What a great idea, too, to put the appetizers on a vertical stand! I have been looking for initial salt and pepper shakers for a while. Thanks for giving the link to where you got yours. 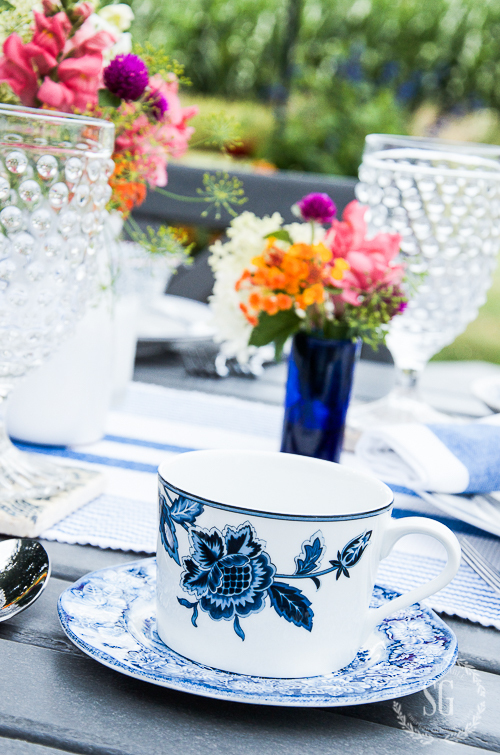 Yvonne, I love, love the blue and white dishes with pops of color in the flowers. I second the idea of Wendy Howell….have you thought of publishing a book with all your beautiful tablescapes, recipes, and home decorating ideas? Oh my…I would buy a copy for myself and give away some to friends. I am always sharing your blog to other friends. You are blessed by God with your talent and even better is how you bless us all by sharing your talents. Absolutely gorgeous Tablescape. Eating a meal here would be a delightful experience. Blue and while is my favorite color scheme too and the pop of yellow and the flowers just make it prettier. Thanks so much for sharing your expertise. Soooo relaxing looking. Love it all, especially the fresh flowers! I love your outdoor table setting. The blue looks so cool in this hot summer that we are having. Beautiful! Both the table scape and the photography. What a charming setting and so colorful! Love, love it! Just lovely! You are such a pro at fine tuning all the details. I too love blue and white and your pictures are delicious eye candy. I have had Blue Willow China for years. I never tire of blue and white! So crisp…just like your table setting. FYI Did you know that on the Andy Griffith Show, Aunt Bea used Blue Willow China? Just a little trivia for today! WOW! Your table looks beautiful! I love all of the hues of blue!! Seems so refreshing and relaxing… would love to have a bite to eat at that table! So pretty and fresh! And who doesn’t love blue and white? 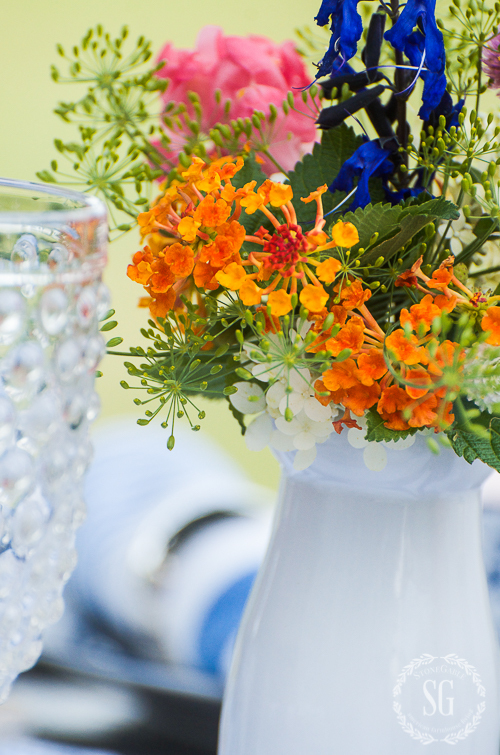 I love how you mix and match to make such a pretty table setting and blue and orange together is one of my favorites. Delightful. A perfect summer gathering place. Wish I were there. Love the cobalt blue! And a small leaf blower is just what I need for my yard. Is yours small? I’ll have to look around. Very inspirational! I love all the mix and match dishes. Beautiful tablescape. I really like the idea of using complimentary coasters. Hi, thank you for your blog. Your home is gorgeous and very inspirational. I wanted to leave feedback about a couple of things. The size of the font is almost too small to read. I can hardly see what I’m typing here. Also, I could not find your home tour and I have enjoyed looking at it in the past. I will miss it if you are not showing it anymore. Thanks and hope this helps. Sorry about the font, Sheryl. You can control that yourself. You may have to make it bigger on your computer. When I do a blog refresh in the fall a different easier to read font is on my list. As far as the tours… I did not do one this summer but have tours lined up for fall and Christmas already. Your tablescape is beautiful! I love it all, but that appetizer tower is fabulous! What a great idea to stack them up. It makes such a beautiful presentation. Your talents are amazing! Yvonne…, you’re the bestest!!! I love Ralph Lauren blue n white dishes but also love Johnson Bros old castles in red !!!! Mixing n matching is fun !! And you Are the inspiration to make every thing work!! It’s so stunning Yvonne! You did an amazing job, wow!!!! Just gorgeous! I love the corn stalks in the background! A definite farm at it’s best! Your blog is great! Thanks for the inspiration! When the farmer plants corn I feel so cozy! Lovely, Wonderful, amazing woman of God, faithful, welcoming, talented, beautiful inside and out. This has to be one of my favorites, just like you, Yvonne! You really are all of the above! Such a joy to start my day with you! Bless your heart, Nan! You make me blush! Oh, Anne I’d love you to send me a picture of your built-ins. They sound so beautiful! May I come spend a month with you and record your every move? You are amazing! Everything looks as stunning as always..look the drink dispenser! Love blue and white… So crisp. Thanks for sharing! Hi Cindy, That’s my word for blue and white… crisp! Everything was lovely. Any guest would feel so honored because of your special touch as a hostess. 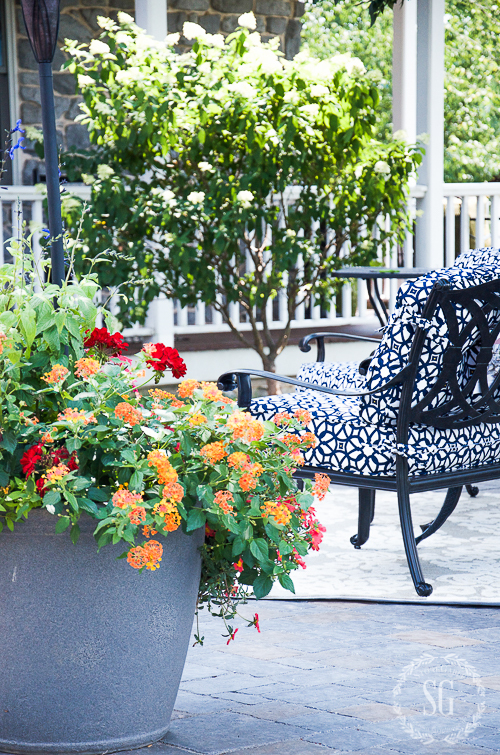 I was impressed with your fantasist patio planter – really gorgeous! Oh my gosh, this is absolutely beautiful. I love alfresco, we are currently making over our gazebo into an alfresco bar area which will hopefully be ready for summer (I’m in Australia). So many details in your post that I love and want to replicate. Beautiful, inviting tablescape. Oh, those orange blooms! Be still my heart! Are they lantana? My marigolds pale beside them……. Hi Jae, Yes, they are lantana. tt’s become one of my very favorites. I love your patio! I also love the flatware that you use and have been on the hunt for a good deal. Where do you find your flatware? I would love to have some white but haven’t found any that aren’t terribly expensive. Look towards the bottom of the post for “GET THE LOOK” you will find flatware with all the other products listed. Click there. These blue and white flatware are a great quality! I’ve always said I think we are related, Yvonne … now I know it! I just bought some sparkling water yesterday that comes in the blue bottles (coincidence – lol!) 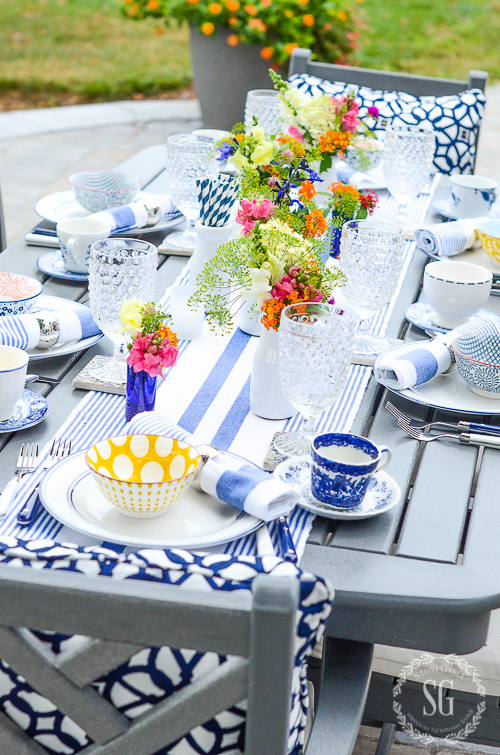 as my color scheme for the table has pretty much always been based on blue & white. Sometimes, I add pink glass dessert plates, or the Chinese “Rice pattern” fruit bowls/plates and sometimes those irresistible green cabbage-leaf ceramics that come from Italy and Portugal. My favorite pastime has always been setting a table and decorating! Your patio is beautiful. I noticed there was a Laurie saying she’d love a cart but wouldn’t know what to do with it at other times so I hope you don’t mind but I added a few suggestions. Keep on giving us those pretty photos … they are SO professional and clear! Hi Elaine, we are kindred spirits, for sure. I love rice china!!!! And thanks so much for giving Laurie suggestions. That is just what I want our community to do! I love mixed blue and white, too! Cool, calm, and collected…All that blue and white! I can picture myself sipping iced tea on your patio enjoying a home cooked lunch with friends. You are invited, of course. A girl can dream, can’t she? Everything is so beautiful but the brightly colored flowers really make the table!! I use vintage silver miss matched silver salt and pepper shakers for small flower arrangememts. Everything looks good in them, even a sprig of ivy or just herbs. Nice on bathroom sink as well, and cheap. May have been shared by MARATHA. Can we get newest comments to the top? Is Reading Glass still open on Rt 30 ? Hi Nan, not sure about the comments, but I can ask my tech people! Reading China and Glass is on Rt 30 in Rockvale Square. Hope this helps. I absolutely love your tablescapes! Your tablescapes were what originally drew me to your site and I love it! Thanks for this one and keep up the great work! What are the blue bottles on the bottom of the bar cart? Thank you. Love your blog and pics! Hi Debbie, the are sparkling water. I found them at my local grocer’s. Thank you. What is the name on them and ill try and find them. Thanks much!! I love the blue and white! I just found some of my mother’s blue and white dinnerware and blue and white handled silverware to match! I can’t wait to be able to use it in a tablescape. I also have some orange and yellow lantana growing in my flower beds which will look just perfect incorporated into a centerpiece. One of my favorite combinations for sure! Lovely! I love dining al fresco. Your table setting and surroundings are stunning! Yvonne, I started a new blog and would love for you to come check it out. Here is the link. Penny, Congratulations on the new blog! Heading over now! We are in our new home and are using a blue and white theme and have added in some orange. I absolutely Love your tablescape…Awesome, Beautiful, Colorful, Inviting, etc. Are you able to share where I can purchase the table runner and napkins that you have? I have only been able to find ones with one or two stripes. Love yours! Hi Kim! Congratulations on your new home. May you be blessed beyond measure and bless others through it! If you look at the bottom of the post you will see “GET THE LOOK”. You will find all the products I used in this post there. Happy shopping! The blue and white is so crisp and fresh. I like the little hints of orange and yellow. Very inviting table! You have a great style. Love the blue and white table scape. It’s so pretty. White and green is my go-to color combination! I like to add in yellow or pink depending on my mood and I have just started collecting copper. And I mean anything – cups for drinking out of, silverware, any and all sizes of containers and the color goes so well with I already love. Thank you for your inspiration and suggestions! Of course, Carol! Come on over! What a beautiful patio Yvonne with all the hot weather we have been having it looks like a cool comfortable place to relax enjoy a glass of wine and a lovely meal. The flowers on the table are beautiful and your porch pots are as well. You did it again ?? I love your tablescape, it gorgeous! What is the brand name of the table and chairs? The most gorgeous pictures ever. I would like each and every one. Well done. Well done. You have arranged a perfect setting as usual. God has blessed you with soooo much talent. Thank you so much Betty! That is exactly what I want to do! Love all the color! Flowers add so much to a table. All they have to do is stand there and look pretty. ? So beautiful, just screenms summer to me. We would dine more outside but our beautiful shade tree had to be cut down and now we have full sun on our deck at meal time. Your back yard is so lovely. First of all, when can I come over? Second, I also collect blue. I wanted to shop your table. That little bowl with the dainty blue floral outside and orange inside was delightful. So classic yet current! The flowers make it magically breathtaking. Whatever our color scheme, collecting with an eye to that plan certainly simplifies life. Thank you for the inspiration. Wow, this table is absolutely gorgeous! I am not sure I would have the time or energy to pull it off, but you make it look awfully tempting. Your guests are soo lucky! What a lovely table! I love all the patterns and added pops of color. I love blue and white china. The colors are just classic but honestly I never thought about mixing the patterns. What a difference it makes. I’ll be borrowing some of your ideas for my sons birthday this weekend! Gorgeously displayed items from Birch Lane. I love shopping online from Birch Lane, easy and convenient. The catalog is beautifully done too. The photo’s are reflecting the outside table scape and patio area fantastically. Lot’s of inspiration! Thanks for posting and sharing the view. I just love the blue/white combo, but must say I think the real star of the show is your beautiful flowers! The colors are amazing and really makes us marvel at nature!! I totally agree with you about buying something you love even if you have no idea what you’ll do with it. Buyer’s remorse is one thing but buyer’s regret is the worst!!! If you love something, you’ll find a use for it just so you can enjoy it!! Thanks again for some beautiful ideas!! What an elegant yet practical outdoor table setting! I love your small vases of flowers that could easily have been cut from the garden. The inviting setting makes me want to plan a few summer parties before the season ends. Thank you for the inspiration! My friend had to spend some time in a nursing home for therapy. I took a little lunch to her from her favorite fried chicken restaurant. Before I going in I placed everything in a beautiful basket with a pretty cloth liner hanging over the sides & a small bouquet of flowers inside. She was so impressed with this little bit of thoughtfulness. I will never forget the smile on her face. The nursing home had a little “Al Fresco” area (although it was really on the inside it was made to appear to be on the outside). We so enjoyed our time together. She is back in the facility & I think I will take her lunch again tomorrow since your post has reminded me of how little details can make a difference in someones day. So beautiful! I have this table runner and the matching napkins and am off to create a blue and white tablescape! your table and bar cart are lovely! So inviting. Can you tell me the name off range flower with multi small flowers? It mixes so nicely with large, single flower stems. Your flower arrangements have inspired me to turn a small part of our garden into a cut flower garden next year. Sorry – I meant the “orange” flower. Yvonne, this has been one of my favorite posts. I love entertaining and new ideas for tablescapes! I am having neighbors over this weekend and will definitely be using your ideas. Beautiful pictures too! Have a great day. I always love your tablescapes Yvonne! I have quite of a collection of them on my tablescape board. I also enjoyed the beautiful furniture, just beautiful! Blue and white, my favorites! Great job as always! Very pretty! Yvonne, your tablescape is absolutely beautiful, and I love the bar cart. If I had one tip to share, it would be to invest in a set of neutral colored dishes in white or ivory. Then you could purchase different sets of salad plates and layer the two to create different looks. This would be far less expensive than buying several different sets of dishes. I simply adore dishes and have several sets. I adore blue and white too and have just started collecting the Spode Blue Italian dishes. I think they may be my favorite. You hit this one out of the park Yvonne!…Gorgeous! !…Love all of the beautiful items on the table set with such perfection…Talk about hitting it out of the park…I was waiting for a photo of Shoeless Joe Jackson coming out of the cornfields! 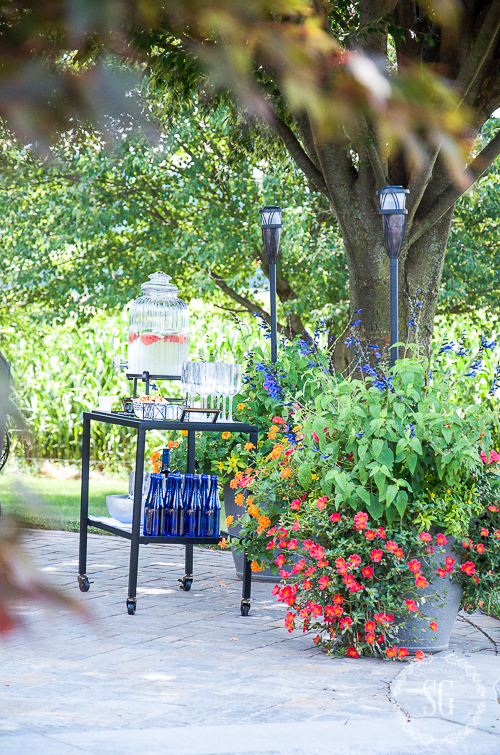 Such a most wonderful and bucolic setting for a special Alfresco Dining event! Beautiful table scape as always! PS: Did I see delphiniums in your planter or was it black and blues??? Hi Deb, I have a tall variety of salvia in my pots. The hummingbirds love them. I was hoping to catch them in a photo but they are too fast! PS… you are amazing too! Very pretty!! I especially liked the before dinner area. Would love to have a bar cart but don’t know where I would keep it when it’s not in use. I collect red, white and off white dishes. I feel the red is festive and white of course goes with everything. My special collection is Makenzie Childs , but I mostly just have decor type items from her. I love seeing your table scales, they are my favorite posts of yours. 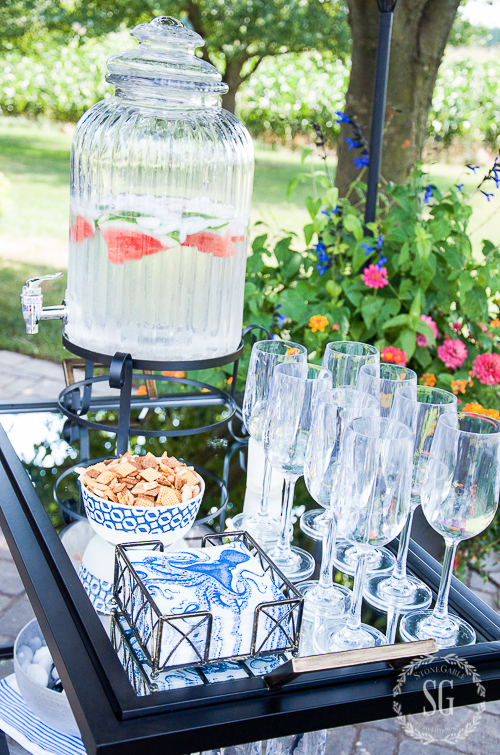 Hello Laurie – there’s lots of spots to use a bar cart! If you have room, I like it in the kitchen where guests can make their own cocktail. (We always make the first drink then encourage guests to make the following as it gets people mingling). I also like it in a living or dining room; again, depending on the amount space in a room. I also have a good size bathroom so sometimes I keep it there stocked with towels on the bottom shelf and a bowl on the top shelf holding pretty scented soaps, lotions, etc. Have fun with a cart as there are no rules! What a beautiful table and so much detail! Anyone would be honored to sit down and eat and talk for hours. What a wonderful post. Lovely…and so many great tips!! I’ve collected a lot of dishes through the years. I love vintage dishes and would pick them up at yard sales and thrift stores. For years my main set of dishes was a white set that I picked up piece by piece. I love vintage floral plates and have bought a lot of them. I use them in my decor: hanging on the walls, resting on easels, under whatever as a sort of doily, in short stacks, and outdoors in my flower pots and water trough garden beds. My Mom gifted me with a bit of green Depression glass and also some Hazel Atlas Pink Crinoline Dishes. I use both sets of these sprinkled around in my decor plus in my vintage blue kitchen hutch. 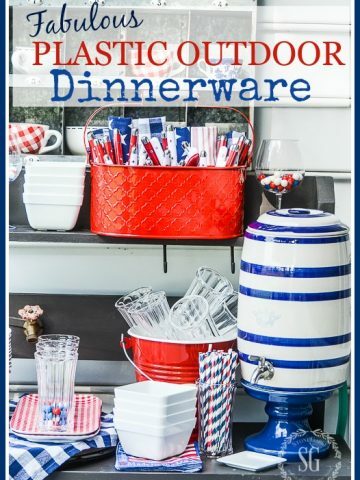 For outdoor dining I have blue enamelware and red melamine plates that I found at the thrift store. Recently my husband bought me an 8-piece place setting of white dishes for Christmas so that I can have enough matching dishes for the holidays. I divided up my old white set between my daughter and my son’s girlfriend. Hi Jen; I love dishes too & have mixed patterns before for table settings. I’ve never owned a white set, but I think that will be my next purchase. Thanks for the idea! I am pulling out the silver. Thank you for reminding me to use what I love. You do tables best, Yvonne! Simply gorgeous!! Thx for sharing! My hub and I love Al Fresco dining. Your tablescape is gorgeous, Yvonne. You have inspired me to start a blue and white collection on a previous post called “Farmhouse Breakfast Tablescape”. Besides the blue and white, I love how you incorporated the splash of color in the flowers, and those cute little Romero bowls that keep speaking to me! I’m a big fan of Birch Lane for the quality of there merchandise. After I go shopping, Lol! My hub and I together with some friends will enjoy our next Al Fresco dining by the pool! Great tips. I start my table with my go to mikasa Italian Countryside and go from there. I have my accent dishes in many different colors and patterns. I also make my own place mats, runners and napkins, ( thanks to you for your tutorials) When you make your own you get just what want. You definitely have great decorating sense! Yvonne. Even eating A peanut butter and jelly sandwich would look amazing at that table. Just gorgeous. Cheers! I am a lover of blue and white also. I love yellow mixed in with the blue and white. Your table looks sooo pretty! Very pretty table setting! Love the appetizer area also. 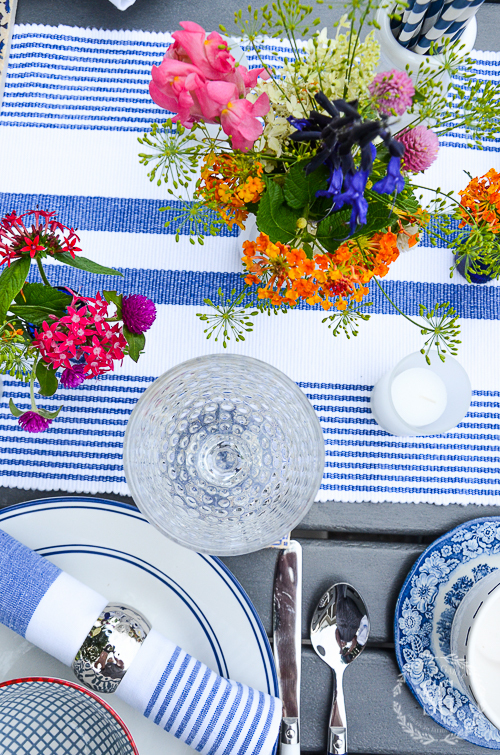 Love it – makes an alfresco table look like it will be a really special occasion. Some of the blue flower ‘vases’ I have used for the tall summer flowers are the empty blue liquor bottles. My blue weakness is the cobalt blue in summer with the vibrant flowers you show on your table landscape. Keep up the wonderful work – it motivates so many of us. Love all the color here! How do you keep everything so clean? My uncovered deck is always full of debris and leaves. I struggle to keep it up. I have an electric leaf blower! I use it all the time. 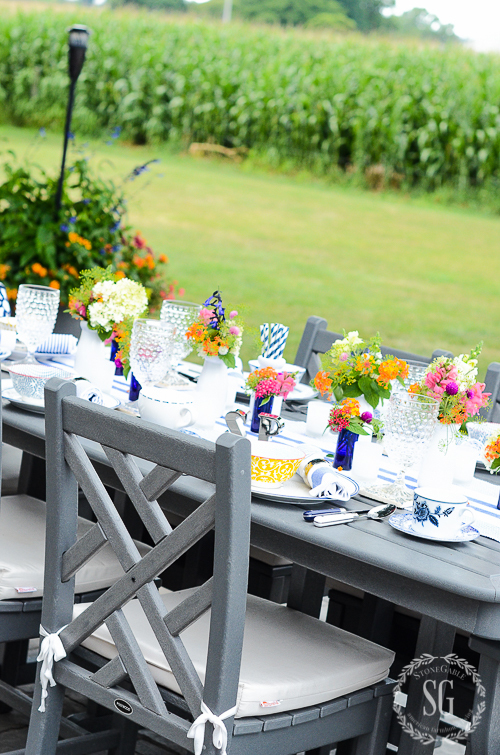 Love the blue and white…such a fresh look and inviting atmosphere! Yvonne, Your combination of colors and patterns makes for an absolutely stunning table. I love it! 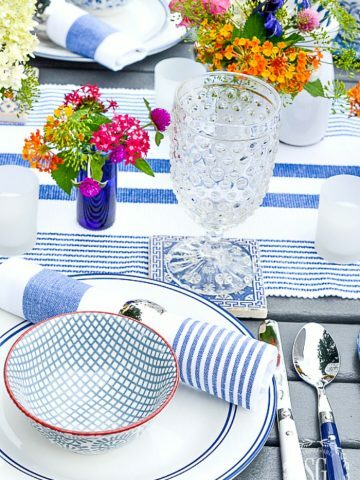 Your table is beautifully set,love all the different little bowls.Such a lovely outdoor setting…….hope I am invited! I absolutely love this table setting. Blue is one of my favourite colours, but I love how you used the bright splashes of color. It looks great. Loving the blue and white! It really says Summer. Loving the blue and white! 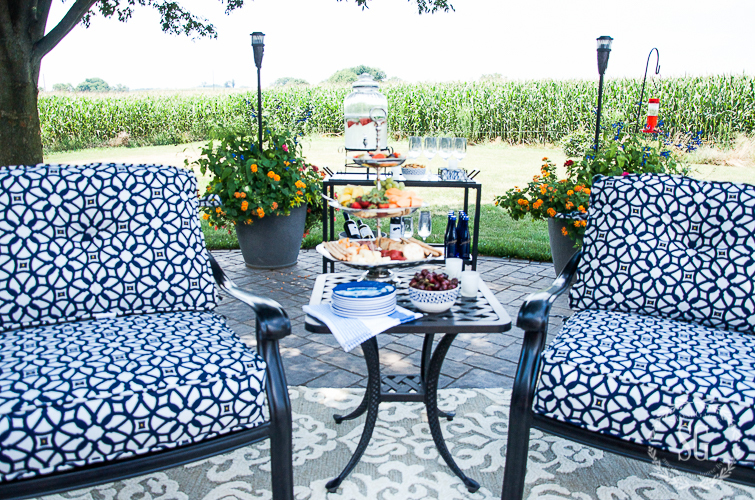 Your outdoor dining is just so inviting! I hope you had a get together that day with friends or family. I really like the bar cart. I particularly like the mismatched, but very lovely, cups and saucers. I have so many…I’ll have to try this! Also, the blue and white straws popped into the white milk jug look so cool! I see fabulous straws all the time now, but didn’t know how to use them at the table. I’m fairly new to Stone Gable, and I love it! I’m learning so much, and I’m experimenting more and more, thanks to you! Hi Nanci, I’m so glad you found us! Welcome to the StoneGable family! Beautiful pictures – I think I just became a fan of blue and white. Everything you do is so perfect and beautiful! I hosted my first outdoor lunch a couple of weeks ago and used some ideas that I got from your blog and some others to decorate my table. Everyone loved it! Thanks for the inspiration! Maybe someday my table will look as good as yours! I’m so glad you are using ideas from StoneGable. Love all the blues, it never fails to work, lots of great ideas here, thank you. We have 15 to dinner outside on the terrace this evening, so I am going to steal some of your suggestions, perfect timing! During the summer months in France we eat outdoors all the time, it’s as close to perfection as anything could be! I’d love to be one of your guests! Love the blue and white! I think I will start a blue and white collection. Here in Florida, the summer heat and mosquitos keep us inside. Can’t wait for fall! Can I come, sit and stay a looong while? What a gorgeous dinner party you had!